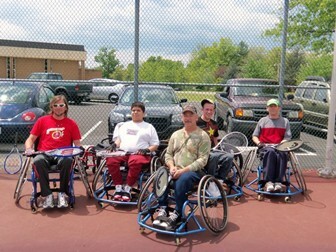 The Mid Atlantic Wheelchair Athletic Association held the Virginia Wheelchair Tennis Clinics from April 13 to May 6, 2011. There were four individuals that participated in this clinic and all of the athletes had a diagnosis of spinal cord injury. The clinics were held on Wednesdays and Fridays from 11:30-1:30 pm for a total of four weeks. Clinics included instructional programming led by Wheelchair Tennis Instructor Chad Reed. He was assisted by Joe Fangman, PT and Lee Whiteford, CTRS. The goal of the clinics were to get athletes ready to play in the Staunton Newsleader Tennis Tournament. This tournament has never had a wheelchair division. The organizers of the tournament were willing to hold a wheelchair division if 3-4 athletes would be willing to compete. At the conclusion of the tennis clinics held this past spring, all four of the athletes agreed to participate in the Staunton Newsleader Tennis Tournament. We were able to host these clinics because of a grant received from the USTA Wheelchair Tennis Committee which was awarded to us in December of 2010 in the amount of $500 and from the Mid Atlantic Wheelchair Athletic Association budget of $300. We used these funds to help with the cost of putting on our clinics, paying the staff to head up the clinics and help with getting our sports chairs in a tournament ready condition for some maintenance and upkeep. The athletes will continue to set up practices with Chad Reed in July to prepare for the tournament and hopefully more events in the future. It is the goal of the Mid Atlantic Wheelchair Athletic Association to continue to hold this clinic on an annual basis in the spring to generate interest in tennis and to get additional athletes ready to play in the annual Staunton Newsleader Tennis Tournament and keep the momentum moving forward and hopefully attracting even more athletes each year.